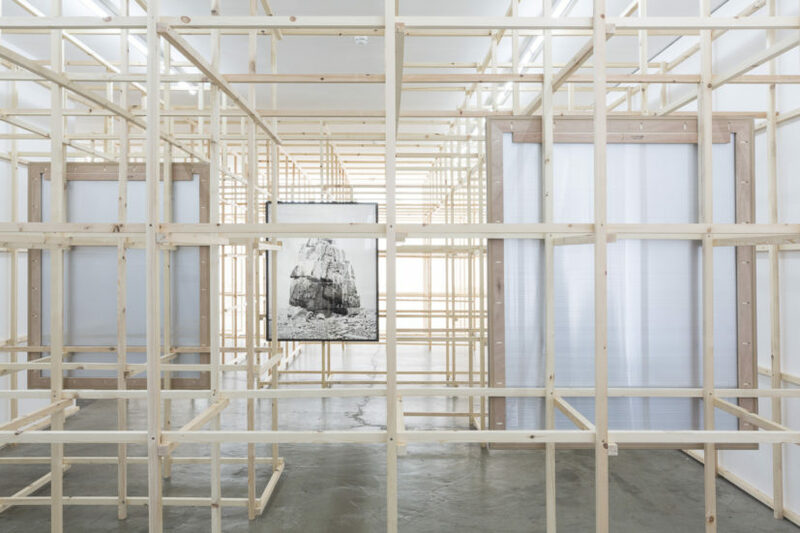 The new exhibition of Noémie Goudal at Edel Assanti is a labyrinthine installation marked by black and white photographs. An architectural wooden frame fills the upstairs space, inspired by the skeletal structures underpinning fake manmade landscapes. 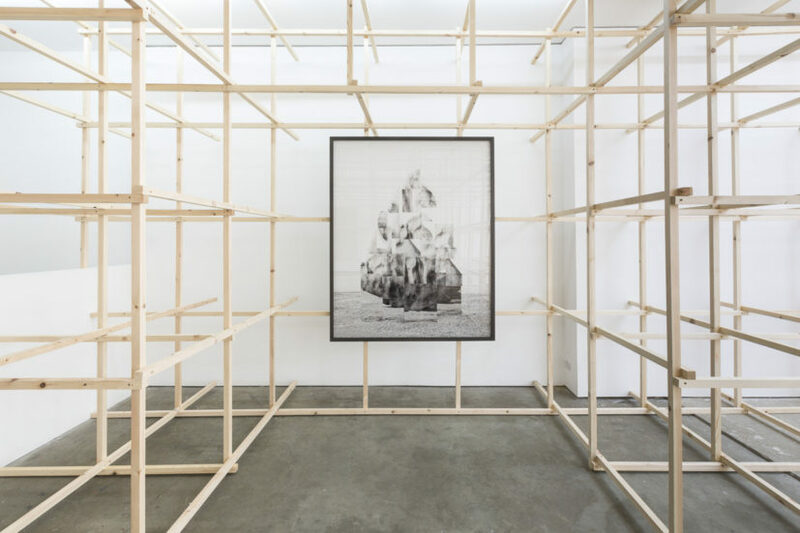 The show displays some new works by the French artist – whose last show in London was at the Photographer’s Gallery in 2016. 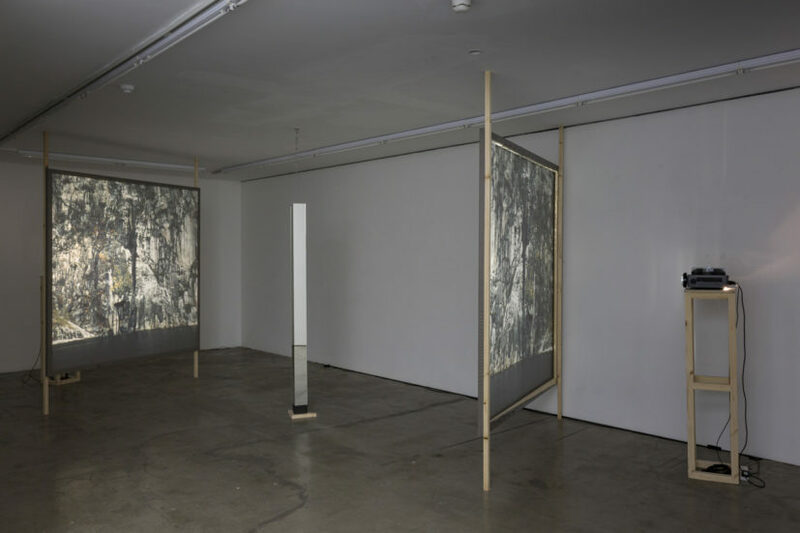 At the Edel Assanti gallery, a series of black and white photographs are rhythmically hung onto the wooden structure, creating a visual framework for the photographs. The encounter with the works prompts a question about what is actually represented: mountains peaks or depictions of an enlarged rock? 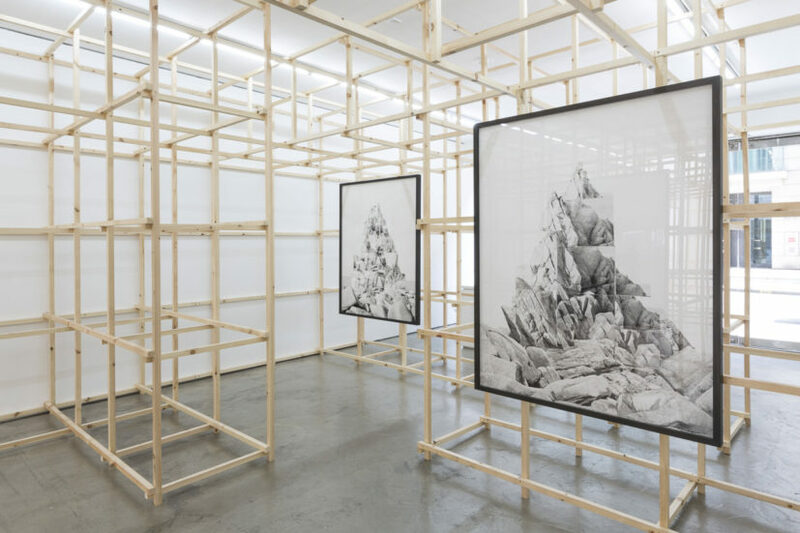 Can a mountain be depicted in its completeness? René Daumal writes in Mount Analogue: “you’ll catch yourself talking to the mountain, flattering it, cursing it, making promises or threats. And you will have the impression that the mountain answers you if you speak to it properly—by becoming gentler, more submissive.” Goudal’s photographs seem to ask for a dialogue with the viewer, one that involves a rhythmic crescendo of what is real, what is fiction and the infinite possible alternatives. 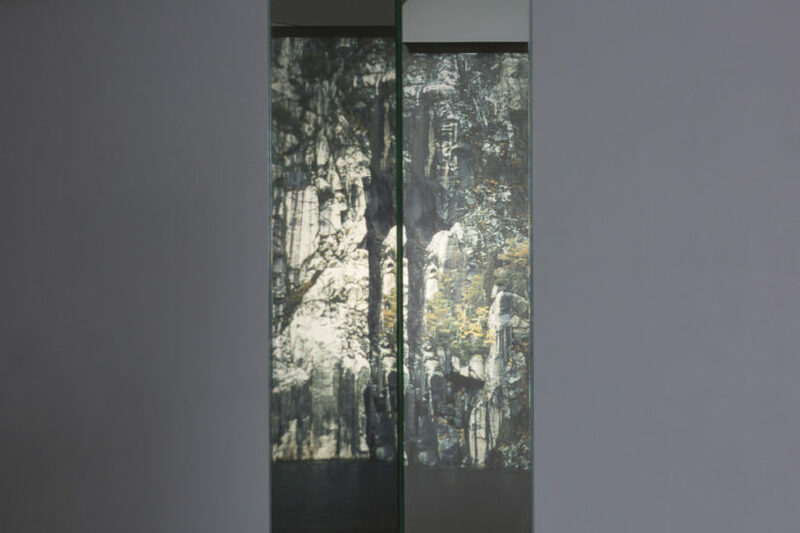 This series, Soulèvement, was made by depicting a number of mirrored reflections from the rock which are later photographed by the artist. The careful and crafted creation of scenographies becomes the subject of her photographs. This staged image-making is a leitmotiv of Noémie Goudal. 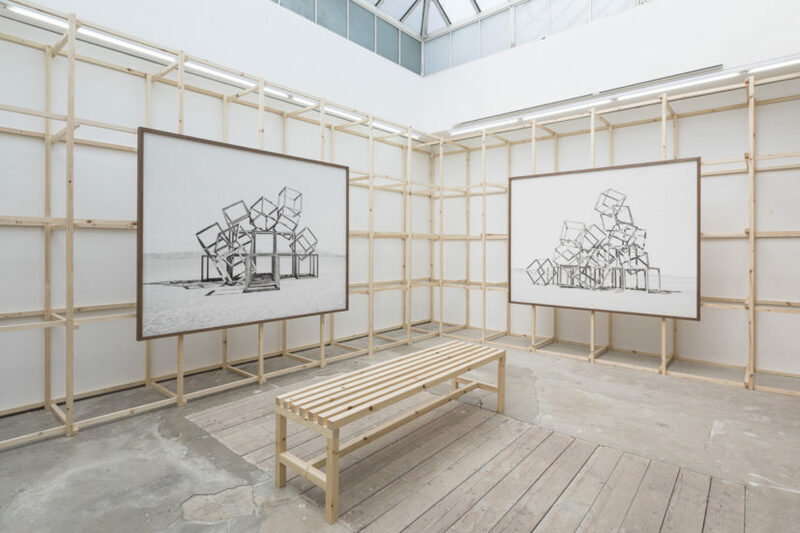 At the heart of the wooden structure are some larger photographs depicting stacked cubes of equal dimensions. In this case the subject of the image is not a landscape but the abstract skeleton of a potential construction, similar to the one recreated in the gallery. Creating a fictive image within a constructed space, any logical reference is blurred. Downstairs a sculptural installation investigates the stereoscope, which was invented in the early 19th century in England. This “Wheatstone stereoscope” uses a mirrored triangle to reflect each eye onto two large images. The sculpture downstairs again evokes the labyrinth, reflecting the image over and over again into infinity. The way Goudal complicates reality and her fascination with the multiple viewpoints brings to mind the great Argentinian post-modern novelist Jorge Luis Borges, who wrote in his collection of short stories Ficciones “I imagined described a labyrinth of labyrinths, a maze of mazes, a twisting, turning, ever-widening labyrinth that contained both past and future and somehow implied the stars.” This expanded description seems fitting to Goudal’s intent to display a multitude of views and perceptions, images of illusions and deceptions. There is a strong call to observe, perceive and ultimately expand the notion of the real.